The day started with cereal with Bantha Milk for breakfast. The kids brought Millennium Falcon cut-out sandwiches with grape and cheese TIE-fighters to school. Dinner featured Imperial Star Destroyer Appetizers, Ewok Salad, Meatball and Salami TIE Fighters on a bed of Bow-TIE Fighter Pasta and Tomato Sauce, paired with Lemon-Yoda, and then Darth Vader Chocolates for Dessert. WOO-HOO! We also made dozens of new friends here at the M4P blog… so for all of you new guys: WELCOME ABOARD, we are so happy to make your acquaintance! We have made many different Star Wars character party designs in the past few years – scroll down to take a look at a few, and find links to all of the others! As always, we ask you not to make and sell these. A, because LucasFilm Ltd. and Disney owns the rights to all characters, and B, because we made the designs and it would be unfair for you to make money off them. We also we want to remind you that we should get credit when the patterns are used. 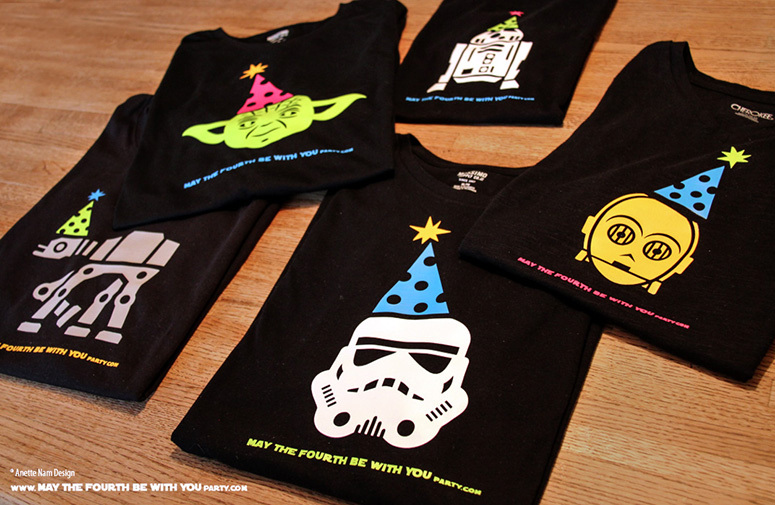 So, if you show your work using our designs anywhere (online as well), put a “Pattern © Anette Nam Design” and link to “Maythefourthbewithyouparty.com” somewhere close by. THANK YOU! 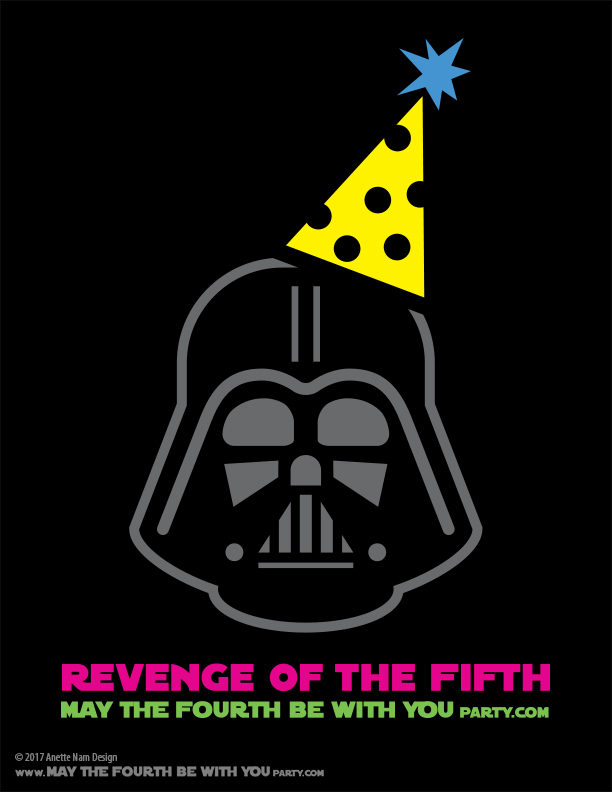 Note, this Darth Vader design was inspired by an original by Symbolicons at iconfinder. You can downloaded the original for individual use at iconfinder.com here. Load and convert the pdf to a dxf file, and reverse the image. Cut out on Cameo. (There are lots and lots of great You Tube tutorials on how to use your Cameo to cut out vinyl, so I will not get into how to use the machine here.) OR print out on printer, place on vinyl and cut through both paper and vinyl layers by hand (NOT the clear plastic layer). Weed the vinyl sheet (get rid of all the unwanted little pieces). I find an X-acto knife is best for this. Close cut the shapes, so there is just a little bit of the sticky clear plastic around each piece. Lay them out (sticky side down) on the T-shirt, cover with cotton fabric, and iron for about a minute (on cotton setting, with no steam). Carefully peel the clear plastic off. Let cool for a while. I love these shirt patterns!! So cute! Thank you so much! I have a blast making them, and so far they have been very popular (lots of hits and downloads) – which make them even more fun to make! We also had a little family party, which I put up on my blog, inspired by you guys! I read your post, and I love the Maz Kanata Dip. Fabulous!!! Thanks for sharing it!! !